The Global Alliance for Patient Access released a new white paper, “NOR-SWITCH: What will Norway’s infliximab switching study tell us about the safety of switching patients from one biologic medicine to a biosimilar?”. The paper, available in English, French, German, and Spanish, stems from discussion among an international group of physicians and researchers who met in June with NOR-SWITCH investigators to discuss the switching study and its potential impact. The group includes leading clinicians from the fields of rheumatology, gastroenterology and dermatology. 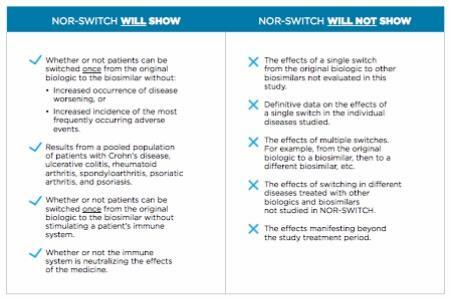 NOR-SWITCH is a randomized, double blind study of how patients across six inflammatory diseases respond to being switched from Remicade to the biosimilar Remsima. Infliximab is a particularly large and complex biologic medicine. The study is funded by the Norwegian government but speaks to international interest in how switching patients from biologics to lower-cost biosimilars might reduce health care expenses. At present, little data exist to predict the impact of such switches. Nevertheless, the need for data and the interest in lowering costs should not lead policymakers to exaggerate NOR-SWITCH findings or apply them inappropriately. Switching of any biosimilar within a class? Multiple switches over the course of a treatment period? Biosimilars could offer patients and physicians more treatment options, potentially at lower costs. But for patients to benefit from biosimilars’ “appropriate use,” policymakers must take care in how they interpret – and apply – data on switching. NOR-SWITCH data will be available at October’s United European Gastroenterology Week in Vienna and at November’s annual meeting of the American College of Rheumatology in Washington, DC.